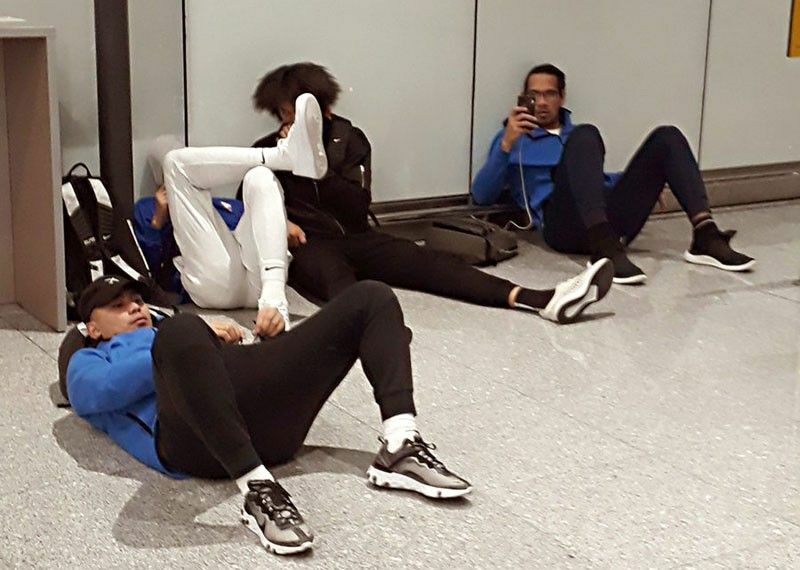 Paul Lee, Raymond Almazan, Japeth Aguilar and June Mar Fajardo sprawl on the floor in their three-hour wait for immigration clearance in Astana airport. ASTANA – Gilas Pilipinas endured a tiring travel from Qatar to Kazakhstan to say the least. Leaving their Doha hotel early Friday morning with hardly a sleep after their game against the Qataris, the Nationals took a circuitous trip to the Kazakh capital with a nine-hour layover in Istanbul and a three-hour wait for immigration clearance in the Astana airport. Sixty dollars per visa, and the lone official in the consular office would not issue a receipt. It’s already 7 a.m. Saturday when the Nationals reached their hotel here, greeted by some drunk punks who yelled unpleasant words. There’s no whatsoever arrangement from the host cage federation, not even a liaison officer. “First time we experienced it,” said Gilas assistant coach Ryan Gregorio. “First time ito, from the very beginning,” said Bong Tulabot, a Gilas support staff member from the time of original Gilas coach Rajko Toroman. Some members of the Gilas delegation felt it was done purposely by the hosts. But the players stressed they wouldn’t be deterred from pursuing their bid. “Ipupursigi namin lalo na dahil must-win game,” said Jayson Castro.